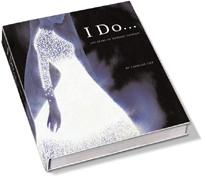 I Do... is a captivating review of wedding fashion over the last century. Chapter by chapter, the book outlines the changes from the ostentatious Edwardian wedding gowns of the early twentieth century to the knee-length flapper gowns of the 1920s, inspired by Parisian couture and the designer Coco Chanel. By the 1930s Hollywood reigned, and film-star weddings, brought a touch of glamour into the ceremony, but was soon to be cut short by the restrictions of the Second World War. The 1960s' mini was worn by few brides, and despite the effect of the hippie counterculture and feminism, marriage still survives today. A widespread subversion in the look of the bride has yet to happen, suggesting that the white wedding is here to stay.